I like big stencils. The kind that fill a page call to me like Maria McGuire's Butterfly stencil. This big wonderful stencil has more to offer than just a butterfly. It is like having a whole bunch of smaller stencils. The details of the design are elements that can be used all by themselves. The two tags above are made from the Butterfly stencil. 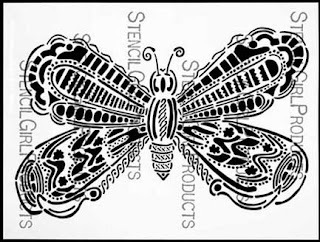 Yes, this butterfly stencil. By taking one small part of it and repeating it I get a completely different look than if I used the whole stencil. 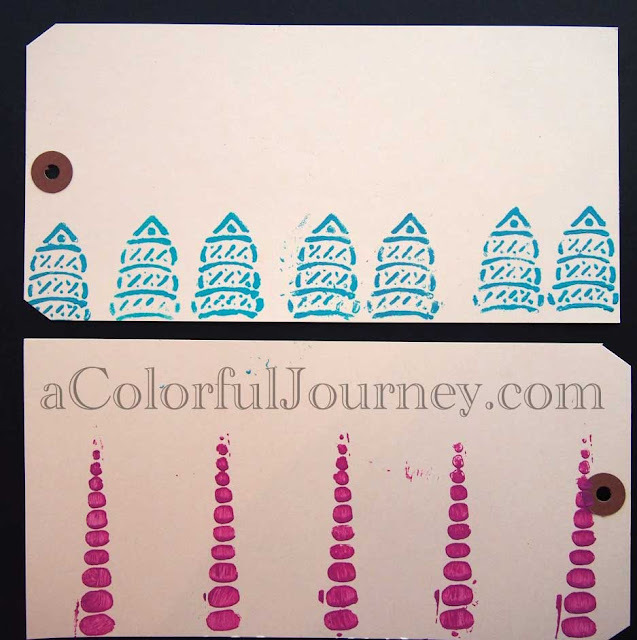 Here's a quick FUNdamental video showing how I used paint with only parts of the stencil. You can watch Stencil FUNdamental Using Parts of a Stencil to Make a Pattern on YouTube here. Stop back on Thursday because Janet Joehlin will be showing how she used markers to create patterns with part of this stencil in her awesome journal! LOVELOVELOVELOVELOVE this Butterfly stencil!!!! I love how you used just parts o it to create a whole new look! AWESOME!!! TFS!